My daughter-in-law called the other day and asked how to cut basil without ruining the plant. It’s very easy. Trace a stem downward and you will find new little shoots coming out at various points along the stem as shown in the photo. Cut just above these new shoots. You can harvest leaves and, at the same time, stimulate the plant to produce more. 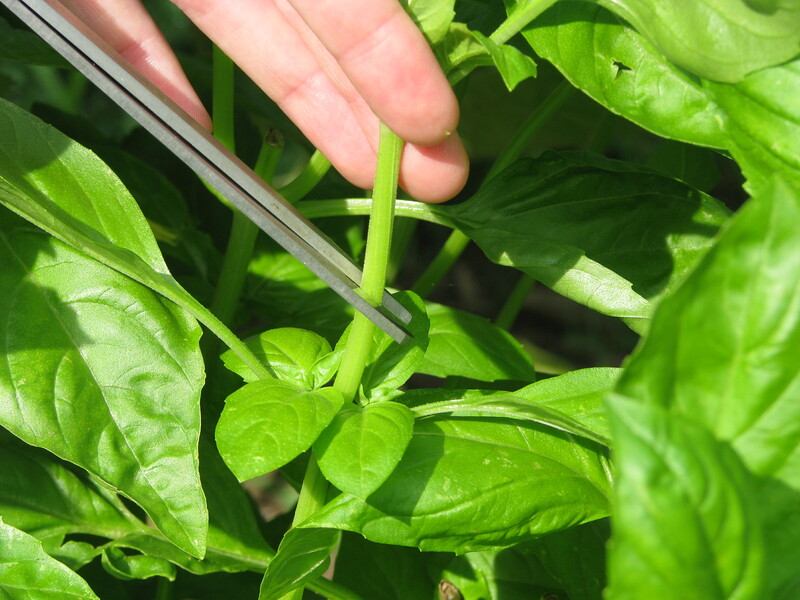 As we have said before, basil has a growth explosion in mid-summer and the plant tries to produce a spike-shaped flower at the end of each stem. You can’t let that process start or the basil will become very bitter. The basil must not complete its sexual cycle – it must remain celibate and you need to help by harvesting and making pesto sauce. By the way, never buy basil if you can see these flower heads. If you plant basil, never do more than three or four plants – that’s about all you will be able to handle. They need full sun and they will produce an abundance of riches. At the end of the summer, I always make a few batches to freeze. Use the recipe in a previous post “Summer Pesto Extravaganza”, but don’t add the cheese. You can do that when you are ready to use the sauce. This makes a great treat in the cold of winter. We have always served pesto on thin slices of baguette during the Holidays. I definitely need to grow a vegetable garden next year. Very helpful, thanks for this post!!! !